Wasily Kandinsky was born on December 4, 1866, in Moscow. From 1886 through 1892 he studied law and economics at the University of Moscow, where he lectured after graduation. In 1896 he declined a teaching position in order to study art in Munich with Anton Azbe from 1897 to 1899 and at the Kunstakademie with Franz von Stuck in 1900. Kandinsky taught in 1901 - 03 at the art school of the Phalanx, a group he cofounded in Munich. One of his students, Gabriele Münter, would be his companion until 1914. In 1902 Kandinsky exhibited for the first time with the Berlin Secession and produced his first woodcuts. In 1903 and 1904 he began his travels in Italy, the Netherlands, and North Africa and his visits to Russia. He showed at the Salon d'Automne in Paris from 1904. 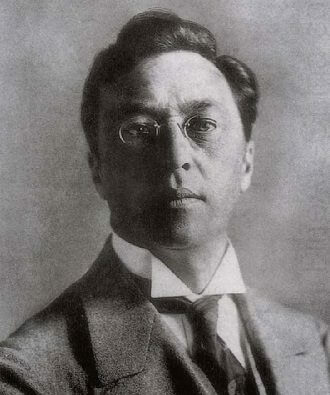 In 1909 Kandinsky was elected president of the newly founded Neue Künstlervereinigung München (NKVM). The group's first show took place at Heinrich Thannhauser's Moderne Galerie in Munich in 1909. In 1911 Kandinsky and Franz Marc began to make plans for Der Blaue Reiter Almanac, although the publication would not appear until the following year. Kandinsky's On the Spiritual in Art was published in December 1911. He and Marc withdrew from the NKVM in that month, and shortly thereafter the Blaue Reiter group's first exhibition was held at the Moderne Galerie. In 1912 the second Blaue Reiter show was held at the Galerie Hans Goltz, Munich. Kandinsky's first solo show was held at Der Sturm gallery in Berlin in 1912. In 1913 one of his works was included in the Armory Show in New York and the Erste deutsche Herbstsalon at the Der Sturm gallery in Berlin. Kandinsky lived in Russia from 1914 to 1921, principally in Moscow, where he held a position at the People's Commissariat of Education. Kandinsky began teaching at the Bauhaus in Weimar in 1922. In 1923 he was given his first solo show in New York by the Société Anonyme, of which he became vice-president. Lyonel Feininger, Alexej Jawlensky, Kandinsky, and Paul Klee made up the Blaue Vier (Blue Four) group, formed in 1924. He moved with the Bauhaus to Dessau in 1925 and became a German citizen in 1928. The Nazi government closed the Bauhaus in 1933 and later that year Kandinsky settled in Neuilly-sur-Seine, near Paris; he acquired French citizenship in 1939. Fifty-seven of his works were confiscated by the Nazis in the 1937 purge of "degenerate art." Kandinsky died on December 13, 1944, in Neuilly.